Fantastic sailing conditions marked the start of the 44th Antigua Sailing Week with clear blue skies echoed in the crystal clear waters of the Caribbean Sea. A breeze of 15 knots from the east gave a gentle start to the regatta. Eduardo Perez-Bengochea’s Gunboat 62 CucuBelle won the first battle of the big catfight in Multihull 1. This is the biggest and most impressive multihull spectacle to come Antigua for many years and these flying machines light up in big breeze. CucuBelle hit the line with pace and accuracy and headed inshore to benefit from the lift off the high cliffs pulling out a big lead on the opposition. Lloyd Thornburg’s Gunboat 66 Phaedo managed to catch up, especially downwind, but CucuBelle won by a significant margin. Angus Ball’s Gunboat 66, Coco de Mer was third. In Class 1, Hugo Stenbeck’s Dubois 90 Genuine Risk nailed the start to perfection. Ramping up the speed with a big dial down before crossing the start line on the “B of the Bang”. However Peter Cunningham’s Reichel Pugh 75 Titan Powerplay won the first race in Class 1 by just under two minutes on corrected time. Today’s big tactical decision in the big boat class was whether to sail inshore and take the shortest route or sail offshore to find more breeze and current. Fred Smithers’ Swan 77 La Forza Del Destino got a fine start in Class 2, only to have to retire on the first beat with sail damage. Peter Harrison’s Farr 115, sporting new hi-tech 3Di Sails, sailed a smart race, no doubt assisted by the highly experienced Antiguan Olympic sailor, Karl James. However, Carol Swift and Stefan Lehner’s Passion 4 C came out on top by over six minutes on corrected time. The German Tripp 56 managed to stay in clear air and sailed well to score its first bullet of the regatta against talented opposition. Paul Fevang’s Norwegian Swan 66 Godot, with a striking pink spinnaker, was third. In Class 3, Antiguan sailor James Dobbs, racing his J/122 Lost Horizon was over-eager at the start and had to go back, which ultimately cost him the race. Phillip Lotz’s American Swan 42 Arethusa won by a slender margin, just 26 seconds on corrected time ahead of Lost Horizon. 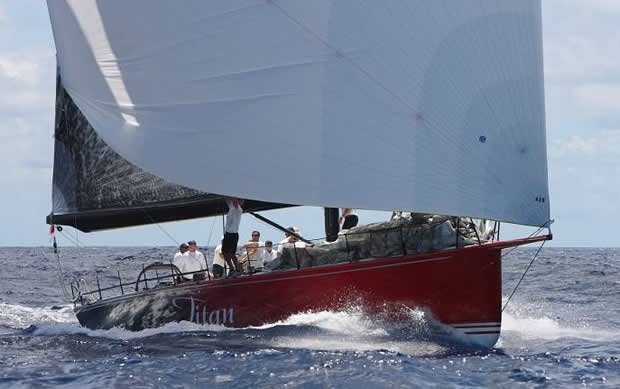 Dig Van Der Slikke’s Grand Soleil 43 D-Trip from St. Maarten was third. Today saw the much talked-about duel between two local boats, Sir Hugh Bailey’s First 456 Hugo B and Carlo Falcone’s one off Caccia alla Volpe. The two boats were locked in a duel all day, barely more than a few boat lengths apart. Hugo B managed to get the better of Caccia alla Volpe by just 49 seconds on corrected time. However neither of the local yachts turned out winners. Calvin Reed’s First 40.7 Elandra took the spoils by over three minutes. There was a virtual photo finish in Class 5 between two British boats. Andy Middleton’s well travelled First 47.7 Global Yacht Racing won by just under a minute from Jonty Layfield’s beautiful Swan 44 Sleeper. American Swan 48 Avocation owned by Hank Schmitt was third. Class 6 enjoyed some great racing today, Geoffrey Pidduck’s Six Meter Biwi Magic is a veteran of Antigua Sailing Week and showed its class today, winning the first race of the regatta by over three minutes. Line honours went to Peter Bainbridge’s J/122 Sky Hunter II and Peter Lewis’ Bajan J/105 Whistler was third. There was a tight battle in Class 7, which is also subject to a pending protest hearing between the top two boats. The top three boats finished less than a minute apart on corrected time. Rick Gormley’s First 38 is provisionally first in class to Antiguan J/30 Blue Peter owned by Tanner Jones. Another Antiguan boat is currently placed third, Bernie Evan-Wong’s Cal 40, Huey Too. Marc Delbaere’s Sun Odyssey 54 Derbisolar won the first race of the regatta in Class 8a. David & Ann Chatterton’s Jeanneau 49 Resting Goose was second with Ian Galbraith’s Oyster 53 Jigsaw taking third. Marinus Woerdeman’s Beneteau Oceanis 393 Limin Carib was an easy boat to spot today, the boat proudly displays Antigua Sailing Week’s drinks sponsor Carib on just about every surface, including crew T-shirts and hats! The local boat sailed responsibly today though, winning its class by a significant margin from Onundur Johannsson’s Sun Odyssey 45 Islandssol. Vincent White’s O’Day 35 Seal was third. Bareboat 1 had a clear winner today, Christoph Nielsen’s KH+P Pinel stamped its authority on the class with a fine win. Tony Mack’s Oceanis 50 Sugar Cane was second and Russel Bertrand’s Sun Odyssey Tartane was third. KH+P rounded off a magnificent day by taking all three podium positions in Bareboat 2. Alexander Pfeiffer’s Dufour 455 KH+P Sea You Later was the winner. Sistership L’Oiseau de Iles skippered by Alfred Geisser was second with KH+P Clarabella skippered by Beate Mohn third.